: The Seven Words of Our Lord on the Cross. 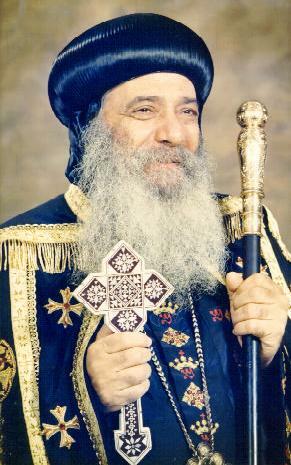 : H. H. Pope Shenouda III. Illustrated by : Sister Sawsan. Typesetting : J. C. Center. : The Second - March 1991.
: 3 8 3 5 / 1991. "Father, forgive them for they do not know what they do"
"Woman, behold your son.. behold your mother"
passion on the Cross. They were a lifeblood for us all. conceded His self-respect. "Love does not seek its own"
to speak. He spoke out for our sake, our benefit and salvation. the Father: "Father, forgive them"( Luke 23: 34). Your hands I commit My spirit" (Luke. 23: 46). manifested in the flesh ". (1 Tim. 3:16). By the word "Father"
represented by the thief on His right side. Son of Man born since the fullness of time..
declaration that the act of redemption was fulfilled. His words, "My God, My God, why have You forsaken Me?" in sustaining God's wrath for the transgressions of man. everything conductive to final redemption has been fulfilled. power of death... and there came the cry of triumph and joy. that the righteous spirit ascends to God after death. one of them trying to grasp their meaning fully. "Father, forgive them, for they know not what they do ". about His sufferings, His pain, His exhaustion or His wounds. ignored because His sole concern was His love for mankind. "Father, forgive them, for they do not know what they do"
has put into practice, beyond doubt, one of His teachings. Christ His work of benevolence and love. unto us, and rendered by us. them, as "For this purpose I came to this hour" (John 12:27). many miracles that took place following his death. subjected to new ingenious unmerciful torture techniques. do not know what they do. " Penitence nobody can attain salvation or forgiveness. Father, forgive those who do believe and repent. likewise perish ". (Luke 13:3). will have to stand trial. told them: "And you will seek Me, and will die in your sins..
believe not that I am He, you shall die in your sins ". "Forgive them for they do not know what they do ". of the World. " (John 4:42). You may forgive a person who just gave you a difficult time. only desire is to let You know that they need Your forgiveness. Justice was satisfied that the penalty has been paid in full. sanctifying the tent with His gushing blood. come down from the cross", and He by saying "Father"
the sacrificial love was able to work for giving forgiveness. He would give to them! Pronouncement: "Today you will be with Me in Paradise. " heart fell due to this look! ... We have no way of knowing. this wonderful thief in reciting this prayer, learning it from him. and us" (Luke 23:39), but He did not reply. you will be with Me in Paradise (Luke 23: 42-43). Me, and you will also live with Me. What a wonderful encounter on the Cross that was! and how the Divine Grace acts within a person. truly that this malefactor entered Paradise deservedly. due reward of our deeds. " for sins perpetrated by others. not despise one of these little ones" (Matt. 18:10). sake, O LORD. " (Ps. 25: 6 & 7). can proudly say: "I am crucified with Christ" (Gal 2:20). only the point of departure for a long lasting friendship. you before. So, remember me! faraway land, a prodigal servant excluded from Your house. the moment of his death. come to Your Kingdom ". imminent moment of death, despair of the Lord's forgiveness. to you, today you shall be with Me in Paradise". you were with Me in torment, you will be with Me in Paradise. of Judgment. Following death, people go to a waiting place. in My Kingdom of Heaven". He said, instead: "In Paradise". will come also with Me in My second advent on the clouds. saying: "Today you will be with Me in Paradise". inaccessible to any human spirit because of the original sin. this soul the gates of Paradise as You did for that thief." the opening of the gates of Paradise was also a Divine Act. earth. He was the one who opened the gate to the wise virgins. To Him the foolish prayed, saying: "Lord, Lord, open to us"
Me". How delightful it is to be in the company of the Lord! rather it is the best that we can have in Paradise. may be also. " (John 14:3). would not say any of that even while being on the Cross. individual is as important as attention provided to a group. persecutors, He attended to the needs of an individual: the thief. only because the whole world's salvation is at stake! The Lord was preoccupied by the others while on the Cross. beloved disciple, John with the task of taking care of her. He entrusted His virgin disciple with His Virgin Mother. wrote the gospel to establish this Divinity. her to his own home" (John 19:27). social care and the first one to receive His care was His mother. Father in heaven is My brother and sister and mother " (Matt. 12:48-50).The Lord on the Cross refuted this false belief. He has denied the faith, and is worse than an unbeliever. " the neglect of his parents and his mother in particular. bear patiently for the sake of all, Oh, my Son and my God". the moment of His deepest pain. her grief. "A sword shall pierce. Through your own soul, also "
different from that between Him and the thief on the right side. The thief started the dialogue, and the Lord responded to him. she remained in his home cared and attended to until her death. and loving one among His disciples. who "Was Leaning on Jesus' bosom " ". . . whom Jesus loved. " given the Virgin even with respect to the father apostles. "My God, My God, why have You forsaken Me?" (Matt. that the Father has allowed Him to be tormented. of atoning for the sins of all humanity throughout the ages. am in the Father, and the Father in Me" (John 14:1l). to bruise Him" (Is. 53:10). "Why did you forsake me? " had only total care and love for his child. considered abandonment without actual severance of ties. turns to ashes and satisfies fully the Divine Justice..
which starts with the same verse. What does this Psalm tell us about Jesus Christ? among them, And for My clothing they cast lots. " starting with: "My God, My God, why have You forsaken Me?" deliver Him, let Him deliver Him, seeing He delighted in Him "
Then why did the Lord Christ say: "My God, My God?" He said that in His capacity as a representative of humanity. became similar to man. "But made Himself of no reputation. assumed all human sins and is paying off all their debts. men, to see if there were any who understand, and seek God. "For He has made Him to be sin for us who knew no sin"
Christ for all that love and for all His abnegation..
source of consolation for us when we encounter any difficulty. Knowing that if the Lord has not "Spared His Own Son" (Rom. allows? God was pleased to put His own beloved Son to Grief. "I thirst " (John 19:28). dried up like a potsherd" (Ps. 22:15). became like great drops of blood falling down to the ground!" had gone and He said: "I thirst". soothing aroma, The Son expressed this by declaring: "I thirst"? into everlasting life." (John 4:14). concluding statement: "It is finished". vinegar to drink. " (Ps. 69:21). instead of water, to double His pain. I wonder, Brethren, that perhaps we are still doing the same. the vinegar of our trespasses, inadvertence and neglect. "It is finished " (John 19:30). Me to do" (John 17. 4). love in full to His own whom He loved to the end (John13:1). despised of the people ". (Ps. 22: 6, 7). us, Christ! Who is the one who struck You?" (Matt. 26: 67, 68). tree" (Gal. 3:13, Deut 21:23). His offering until it turned into ashes (Lev 6:10). crush the serpent's head. God, by reigning over the cross (Ps. The words, "It is finished" is the cry of joy and triumph. look at the work God assigned to you and say: "It is finished"? manner He accomplished His work before the Crucifixion. to the Father." (John 16:28). power to take it again". we know from this phrase? all dry when He said: "I thirst". power. In other words it demonstrates His divinity. be like his " (Num 23:10). getting forgiveness for yourself, to forgive the others. "Forgive, and you will be forgiven " (Luke 6:37). also forgive you" (Matt. 6:14,1:5). forgiveness for yourself and not for others. for love and not as a necessity. the Lord has laid on Him the iniquity of us all" (Is. 53:6). forgiven for love, you will have ascended the Cross. forgiven the offenders for they know not what they are doing. thief on the left who cared for nothing but to save his body. the due reward of our deeds." future life in the heavenly kingdom. If you have not done that already, start now!??? should be in no way discouraged whatever your sins may be. God's response to our prayers could be. Wish to be with Him; to enjoy looking at His joyful face.